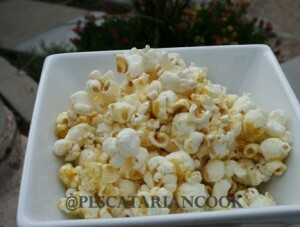 Growing up my mom would throw nutritional yeast on just about everything, but topped on popcorn was my favorite. I flat out crave this weekly. My 2 year seems to have caught the bug too and tries to pull out the popcorn maker daily along with her blue popcorn bowl. All the while singing a made up song with the main verse something like “making popcorn for Ari”. She then pushes her little chair from the living room to the kitchen to get up high enough to watch the process. I guess it must be a pretty big ordeal because she has started to push over TWO chairs to support a little dance as she waits. My husband has never really gotten into the whole nutritional yeast on popcorn idea so he just rolls his eyes and asks me “can you just make plain popcorn?”. I tell him that I’ll make a separate batch because we are not going to give up any portion of the first batch for boring old plain popcorn! I love that my daughter enjoys it. Nutritional yeast is a a complete protein. Can you believe it, a complete protein packed into those little flakes? Not only is it a complete protein, but it is packed with B-complex vitamins. All the more reason to load it on. Now nutritional yeast will not just stick to dry popcorn so you need a base. Here is where you can get creative. Growing up we used old fashioned butter, but a more health conscious self has switched to either a combo of butter and olive oil or now virgin coconut oil which add a great flavor. Now I do have a skinny version for those who want to avoid oils all together. I mix the nutritional yeast with a bit of water to create pourable yeast and then I drizzle it over the batch of popcorn and I must say it is pretty effective and tastes great. Where can you find this golden treasure? I purchase my nutritional yeast from the bulk section of our local health food store. I lived in South Texas and New Orleans for a while and could not find it anywhere so my mom would ship me batches so I could get my fix. Just an FYI, I found that canned nutritional yeast just doesn’t taste the same as the nutritional yeast flakes you can purchase in bulk.